I love tamales. Whenever I spot them on the menu at a Mexican restaurant, there is no question about what I will order. There is a certain satisfaction in peeling back the corn husk to reveal that dense masa dough surrounding a flavorful filling. Tamales are, in my opinion, a top comfort food. Periodically, I make a batch of tamales in my own kitchen. Usually, they are filled with chicken braised in salsa verde; occasionally, a beef or lamb roast gets shredded and spiced up with some of my homemade enchilada sauce; sometimes, I even take the extra step of smoking a pork roast before tossing hunks with some green sauce. All fillings are delicious, and I love having tamales in my freezer for easy meals. However, my tamale supply has been empty for awhile now, and time hasn't been on my side to set up that assembly line of corn husks, masa and filling. For times like these, I have a cheater (and very Midwestern) version of tamales in my hip pocket: Tamale Pie casserole. Like the real deal, the protein filling for Tamale Pie is very adaptable to whatever is on hand. I have made this with the prescribed chicken (usually leftovers from a roasted bird), but also with roast pork and ground beef. Serving along side a tossed salad makes a complete meal. 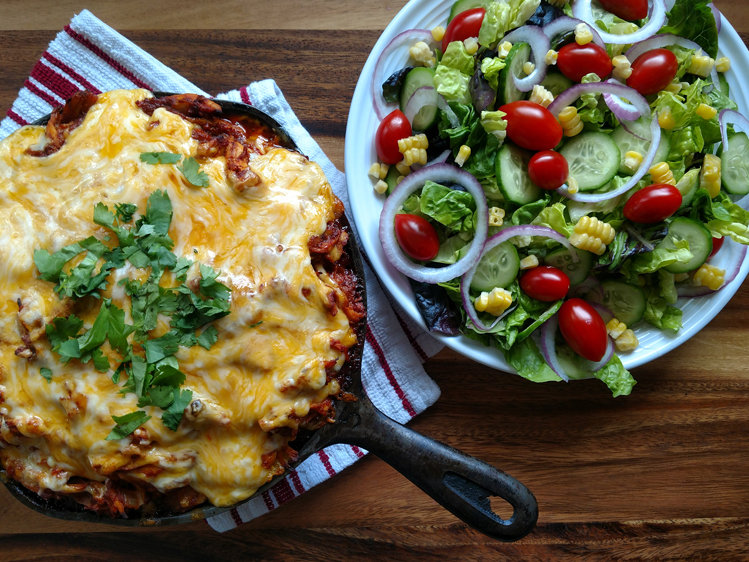 Tamale Pie, truthfully, lacks the authenticity of real tamales, but this casserole makes up for it with delicious, comforting flavor. Tamale Pie is a Midwest twist on an authentic Mexican dish. Preheat oven to 400 degrees. Combine muffin mix, sour cream, egg, corn kernels, half of the green chilies and butter. Pour the corn mixture into a lightly greased skillet or an oven-safe pan. Bake 15 minutes, until golden. While the corn mixture bakes, heat olive oil in a large pan. Add onion and cook until translucent. Add garlic and cook for approximately 1 minute more. Add taco seasoning, shredded chicken, the remaining half of the green chiles, and 1 can of the enchilada sauce. (Here, I sometimes add Ancho Chili Powder for more flavor.) Mix thoroughly. red or green enchilada sauce? I have only used red enchilada sauce, but I am sure that if you prefer green, it would still be delicious.